Doctor Who fans got a big Christmas gift when it was announced that for the first time, the Christmas special, this year Doctor Who: A Christmas Carol, would be aired simultaneously on the BBC in the UK and BBC America in, well, America. And now, in case you missed out, it’s been given a quick turnaround to DVD today (Feb. 15). Does the world need another A Christmas Carol? Of course not, but loosely basing this on Dickens’ classic Christmas story gives the latest Doctor Who mastermind, Steven Moffat, plenty of chances to have fun with tricks of time and space. 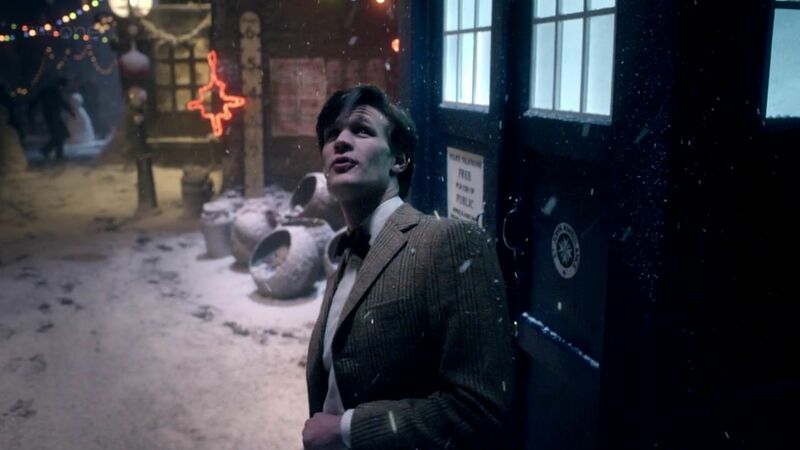 Matt Smith is the 11th doctor to travel in the TARDIS booth, and he’s joined in this Christmas special by Michael Gambon (aka Dumbledore, of course) as the Scrooge of sorts for this tale. 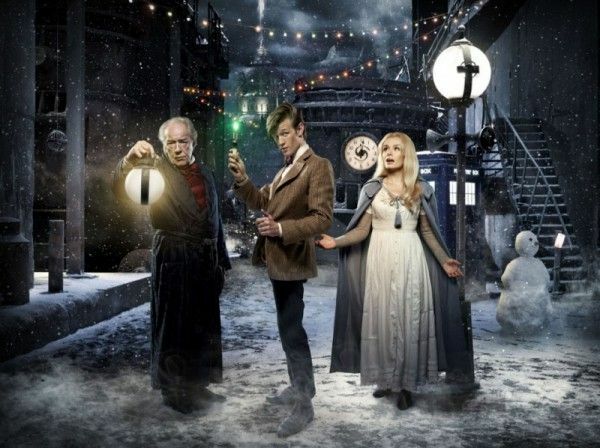 Hit the jump for a review of the DVD release of Doctor Who: A Christmas Carol. As this, the sixth Doctor Who Christmas special since the series was revived by the BBC in 2005, opens, we find the doctor’s latest time-traveling companion Amy Pond (Karen Gillan) on her honeymoon with Arthur Darvill (Rory Williams), and their honeymoon outfits alone are the first thing that will make longtime Doctor Who fans smile. When the ship they’re traveling on encounters a dangerous storm over a mysterious planet, Amy puts out a distress call to the good doctor. Unable to stop it from his trusty TARDIS, which gets a spiffy makeover for this incarnation, the doctor (Smith) lands on the planet to check things out. There, he finds that the planet’s atmosphere is regulated by an isomorphic machine controlled by Kazran Sardick (Gambon), and that’s where the real magic of this show begins. Even after being informed that if the ship crashes it will mean the deaths of 4,003 people, Sardick (made into a curmudgeon’s curmudgeon by the great Gambon) refuses to break up the storm, forcing the doctor to play the role of a ghost of Christmas past of sorts. I don’t want to give too much of this away, but in returning to encounter Kazran as a child, he finds out he was enchanted by the fish that fly around the planet, and you will be too. It’s the kind of visual wonder (that turns even crazier when it involves a shark) that just makes Doctor Who so much more fun than just about anything that tries to pass for sci-fi on current American television (at least since Firefly). 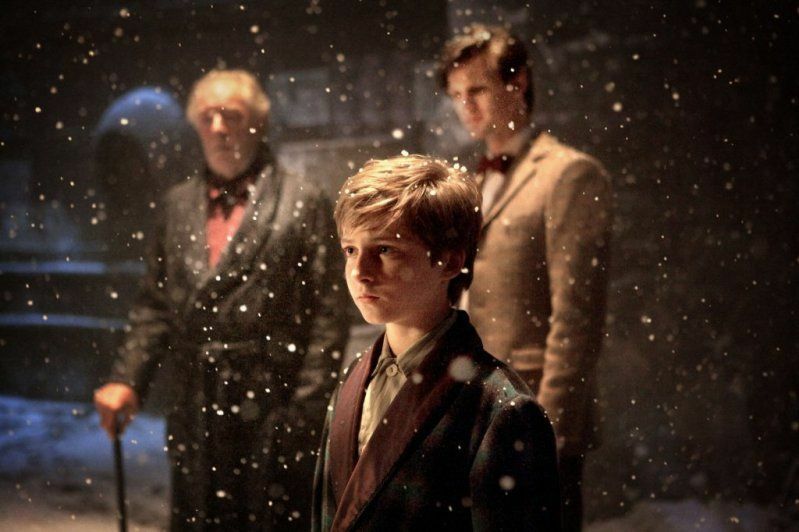 As the doctor returns each Christmas eve to try and slowly melt Kazran’s icy heart, he finds out that the grown miser of a man is also a loan shark who cryogenically freezes family members of people who take his loans as insurance. One of these is Abigail Pettigrew (the Welsh singer Katherine Jenkins), who can soothe and control the flying fish with her singing voice. If this all sounds crazy, it is, but it’s also pure Doctor Who fun, and Moffat and his co-conspirators make the most of borrowing just enough of Dickens’ tale and turning the rest of it on its head. Just who the “ghosts” of Christmases present and future are is something you’ll have to discover for yourself, but it packs an emotional punch while at the same time just being a wicked trip. Along the way, in one of the best of many sly jokes, the doctor encounters Frank Sinatra and a certain starlet, with consequences that will make longtime fans and new ones alike smile. Smith brings to the role of Doctor Who much the same qualities as Benedict Cumberbatch did with the BBC’s Sherlock, giving him a classic flair even as the surroundings turn at times obviously modern and beyond all rules of time and space (and Moffat, not at all coincidentally, wrote all four episodes of Sherlock too). Gambon chews on the roles of both Kazran Sardick and his father, Elliott, all angry, bitter bluster until we learn Abigail’s secret (which you won’t learn from me),and the tale turns yet again. The DVD extras on this are a real treat for Doctor Who fans. Doctor Who Confidential: Christmas Special 2010, a making-of special, starts with Smith, Gillan and Williams on hand for the lighting of the Christmas lights in Cardiff, Wales, which you can just tell is a truly geekish gathering in all the best ways, and after that shows how the special all came together. Even better is Doctor Who at the Proms 2010. I’m not familiar with what exactly “The Proms” are, but it seems to be the BBC’s version of upfronts, which involves the doctor and his crew presenting clips from seasons past and future at the Royal Albert Hall, all backed by an orchestra playing the music of Doctor Who and with a series of special guests. It’s a weird, kind of wonderful event that would be a blast to see live, but is almost as much fun on DVD. The bottom line: Doctor Who: A Christmas Carol is a seriously fun ride, and will be enjoyed just about equally by longtime fans and anyone who’s somehow never experienced the Doctor Who phenomenon but just wants a good Christmas special that plays all kinds of games with the traditional rules of the genre.